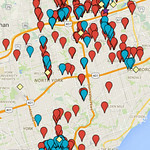 Map of my Foodie Places! After our Da Vinci Code room game play at EscapeZone, we went for ramen! It was definitely the best choice of food on a chilly -19 C degree day. 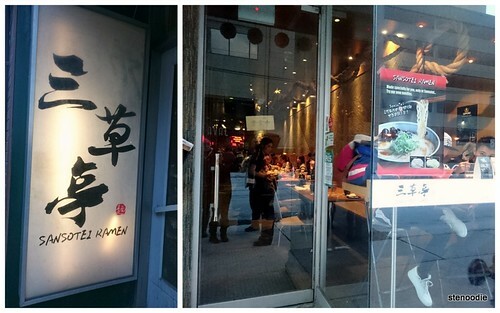 We decided on Sansotei Ramen on Dundas near Bay. Sansotei is so popular that you almost always have to line up for a table. It also doesn’t help that it’s quite small inside with only a long row of tables. I had been to Sansotei in the fall of 2012 and remember lining up outside for at least 10 minutes before we were seated (pre-blog days). Despite arriving here after 3 p.m. on a weekend (which is when lunch rush hour should have died down long ago), we still had to wait for a table! So popular! All of their menu items fit on the back of this sheet! So simple. Arriving here on a Saturday afternoon around 3:30 p.m. meant that there were no line-ups seen from the street! 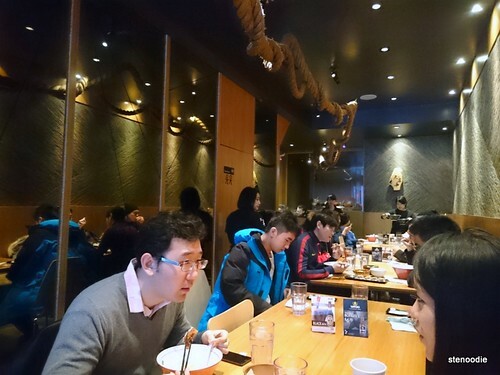 However, because we were a large group of 7, we waited around 3 minutes before we had a table (due to the late lunchers still slurping on their ramen :9). 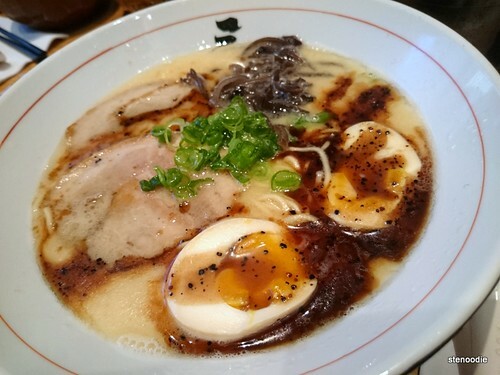 I chose the Tonkotsu Black ramen (the difference between this one and the Tonkotsu is that this one contains garlic oil). 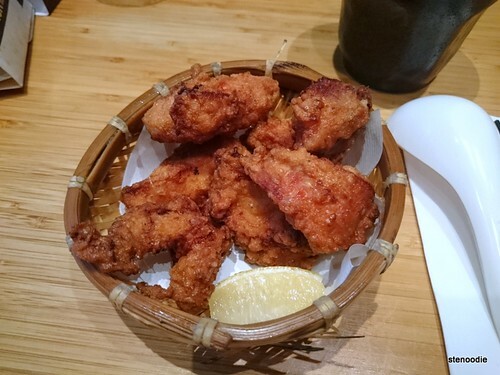 I also ordered the Fried Chicken appetizer as it’s usually very hard for me to refuse trying out karaage zangi (I like comparing karaage from different restaurants 🙂 ). I shared this with Alejandro who also ordered the Beef Bowl appetizer to try and share. Our server was very efficient and organized, making sure all our orders were written down on her notepad and repeating our food and drink orders before arriving with the orders in a timely manner. Yum! The Fried Chicken was very hot when it arrived and tasted all right. It was crispy for sure but the seasoning wasn’t amazing. The Beef Bowl, on the other hand, was something special. 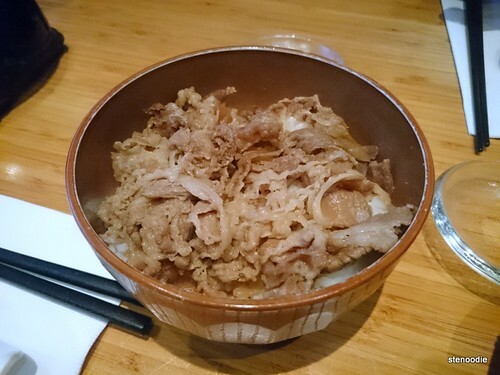 There were flakes of thinly sliced beef in it that were nicely flavoured and sat on top of Japanese rice with some kind of preserved vegetable chunks. It was unbelievably delicious!! 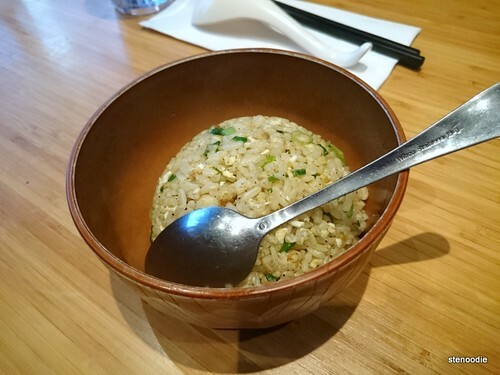 I really loved the tiny Japanese rice grains that paired so well with the beef. You have to try this! Finally, the ramen. 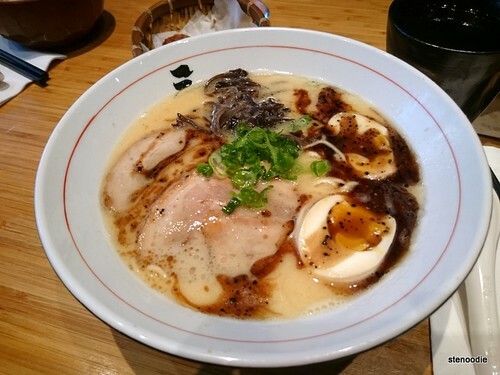 The Tonkotsu Black raman arrived in a deep bowl. The contents were arranged carelessly in a perfect presentation. Just look at how beautiful and flawless it looks! My bowl of Tonkotsu Black was ordered with thin noodles (or you can choose thick noodles) and contained two slices of pork belly, black fungus, egg, green onion, and garlic oil. It was soft-boiled and the yolk was gooey and delicious. The soft-boiled egg was cut in half and I actually tasted one half to be colder than the other one. Interesting! Oh, I absolutely lovedddd the broth. One spoonful and I couldn’t get enough of more. It was a bit creamy and veryyy flavourful. I didn’t feel thirsty after the meal which was awesome! The thin ramen was definitely stringy and thin. It was a bit al dente and paired well with the soup broth. Yum! There were bits of chopped green onion and black fungus in the bowl. You could also clearly see the garlic oil floating on the surface of the soup. All done! 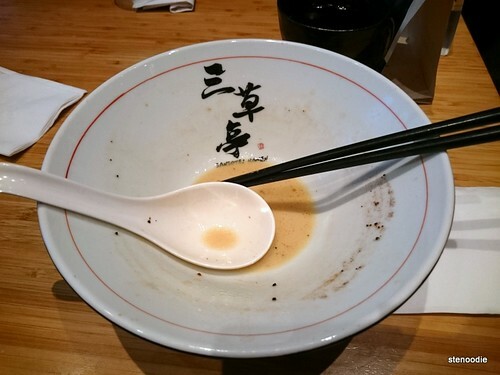 The very first time I’ve finished up the entire bowl of ramen down to the soup! Lastly, the pork belly slices were moderately thick and chunky. They were firm and meaty and unfortunately didn’t melt in my mouth. To me, they only tasted okay but I could also tell the meat was very high quality. 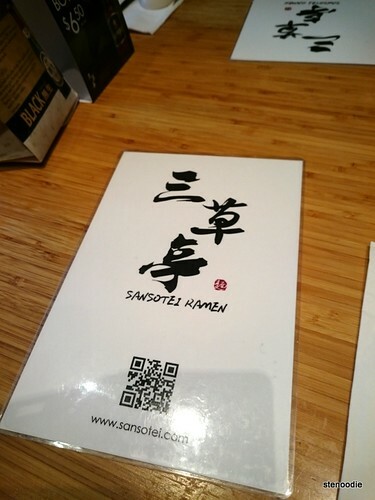 People ask me what I thought of Sansotei — I liked it but I still really enjoyed my ramen experience at Santouka (also located close to Dundas Square and very, very popular). This entry was posted in Food and tagged 179 Dundas St West, @SansoteiRamen, beef bowl, black fungus, downtown, egg, food blog, foodie, Fried chicken, garlic oil, Gyudon Beef Bowl, Japanese, Karaage, popular, pork belly, ramen, restaurant review, Sansotei Ramen, thick noodle, thin noodle, Tonkotsu Black, Toronto, Zangi (Deep fried chicken). Bookmark the permalink. 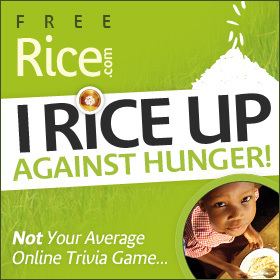 Play games to donate grains of rice!